Here’s a great opportunity to inject a bit of competitive spirit into encouraging people out of single-occupied cars (except for electric cars). The 2016 Commuter Challenge kicks off on June 6th and will run until 15th July 2016. Businesses – got a problem with car parking spaces? Want to encourage lift-sharing or train travel? Or would you like to see more employees cycling? Promote the challenge and encourage departments to compete with each other! Anyone and everyone from your organisation can sign up and log their journeys through the period. There are various rewards and prizes for best performing organisations etc. Anyone signing up before June 6th gets entered into a prize draw for VIP tickets for the Tour of Britain. Click the images of presentation slides for more info. Register for the Big Commuting Challenge to receive a discount on bus travel. From 1 – 31 July, everyone registered for the Travelwest Big Commuting Challenge will be offered 25% discount off First bus weekly tickets as an incentive to switch from driving to taking the bus into work. This is a great opportunity for you and your colleagues to switch your Big Commuting Challenge journeys to the bus! To sign up for the challenge, log your journeys, and find out more information head to www.travelwest.info/bigcommutingchallenge. On Monday (June 15th) Siniat are hosting a Travelwest Road Show at Gordano House, Marsh Lane, Easton-in-Gordano, BS20 0NE … Royal Portbury Dock. 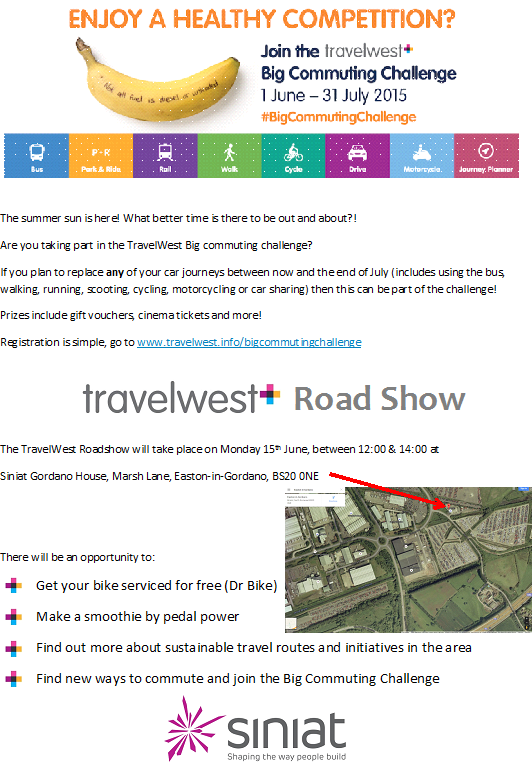 Come along and have a go at making a smoothie by pedal power, get your bike fixed, find out more about local transport initiatives and travel routes … and sign up to the Big Commuting Challenge. If you’re an employer wondering whether a Road Show would be useful for your location, come along and see for yourself! Spread the word on Monday and download the information poster. Now in its second year, and building on the success of previous JamBusting Challenges we are inviting all businesses across the West of England to join in. We aim to reduce congestion in the area by encouraging fewer single occupied car journeys to work. During the months of June and July 2015, your employees will be able to join the challenge simply by switching the way they travel to work. Every single journey made by walking, cycling, public transport, car sharing or any other sustainable mode instead of taking a car alone can be logged on the easy to access website. Working from home also counts as this contributes to another vehicle off the road! Last year over 200 businesses joined in, with over 3000 individuals taking part. The leading businesses were recognised at the Travelwest Business Travel Awards in November. If you have not taken part previously you will need to register your business online at www.travelwest.info/bigcommutingchallenge with a nominated administrator. Previous participants will need to check business details as we will be pre-registering those companies. Once your business is registered your employees will be able to sign up and start recording their journeys made during the months of June and July. Every single journey logged counts towards your total score. The success criteria is the % level of participation in the challenge rather than distances travelled, so by encouraging as many people to join in you could quickly be rising up the leader board. Promote the challenge to your staff with these downloadable resources. The Travelwest Roadshow team travel advisors will be available to provide advice and support before and during the challenge. There’s also a chance to host a Roadshow. More information here. Watch out for future mails with further Challenge details, and hints to motivate your staff to take part.